"A co-worker brought this and I could not believe it wasn't pork! The ingredients surprised me...but this is a fab slow cooker recipe! Not exactly low cal...but full of protein for sure. Tweaked a bit to make it mine. Can you say Keeper? Make your sandwiches with coleslaw if you're from the south! The recipe freezes very well." 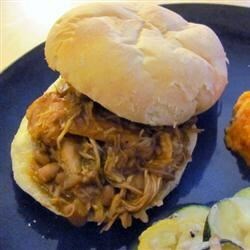 Place the turkey thighs, baked beans, onion, barbecue sauce, yellow mustard, cumin, and salt into a slow cooker. Set the cooker to Low, and cook 10 to 12 hours. Remove the turkey thighs, and shred meat using 2 forks. Discard bones. Return the shredded turkey meat to the slow cooker. To serve, place about 1/2 cup of shredded turkey and sauce onto each potato roll. A classic Thanksgiving with a Cuban twist! This is an easy weeknight meal! We loved it! I couldnt find turkey thighs so I used chicken breasts. I will definately make this again. Made this using a barbecue sauce that I made instead of bought. Loved the addition of baked beans, makes this recipe unique! Will definitely be making this again! yum, the only dislike i have is that it takes so long even though it is totaly worth it. Everyone liked this. Have made it as a dinner for company. Super easy, too. Would give it a 6 if possible. This was SO good and SO easy to make! It is definitely going to be a staple in our house this winter. This was very very good. I would definitely make this again. I didn't even have mustard and it came out delicious.